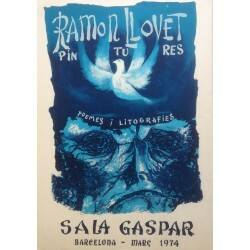 RAMON LLOVET (Barcelona, 1917 – 1987). He started his studies of painting at the age of 14 year in the “Escola de Belles Arts Llotja de Barcelona and at the L’Athenos. After a period studying materials and colours used by the great painters he did complemented with studies of scientific experiments at the Institute Max Doerner in Munich. 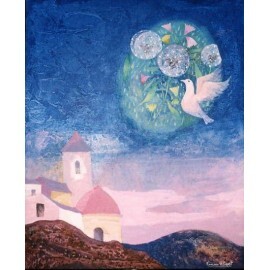 Accepted by the Catalan Vanguard he studied the Catalan Popular Art and exhibited in Sala Gaspar in 1958 and later in 1962, 1965, 1968, 1974 and 1977. Since the beginning he was interested in poetry and philosophy, later in oriental religions. LLOVET Ramón There are 4 products. LLOVET Ramon. "Flors i colom l'espai". 1981. LLOVET Ramon. "Interior i espai". 1981. 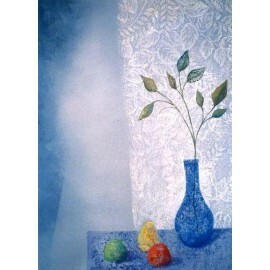 Historical poster Artist: Ramon Llovet Title: "Pintures: Poemes i litografies" Year: 1974 Size: 78,5 x 54,6 cm. Attention! The colour that you see at you screen may vary from the original poster. Tiny foxing spots may be present. LLOVET Ramon. "Pintures i caixes". 1977. 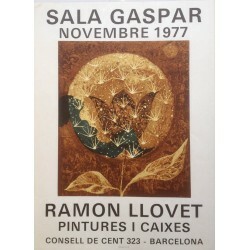 Historical poster Artist: Ramon Llovet Title: "Pintures i caixes" Year: 1977 Size: 71,3 x 52,1 cm. Attention! The colour that you see at you screen may vary from the original poster. Tiny foxing spots may be present.